With muddy hands and dusty dresses, the Diene walk home after a day of garden work. 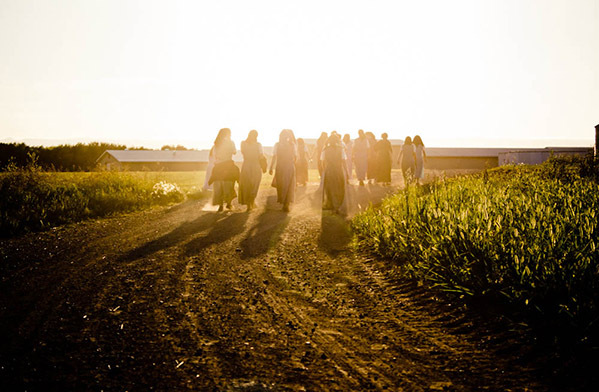 At the End of the Day Photo by: Kelly Hofer With muddy hands and dusty dresses, the Diene walk home after a day of garden work. 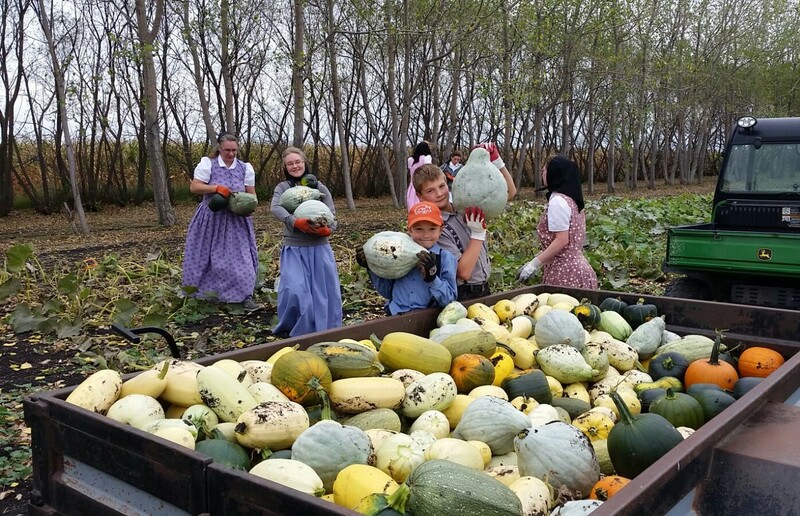 Gathering Gourds Photo by: Shannon Maendel Fall garden work includes gathering the gourds. A time of thanksgiving; to reflect on the past year of harvest, one of the final jobs of the season before the long cold winter sets in. The Blueberry Hunt Photo by: Lisa Waldner Clambering over underbrush to find blueberries is a typical summer job. Fresh wild fruit is a specialty for everyone, as are muffin and pies made from the frozen blueberries. Planting Trees Photo by: Lenita Waldner The more relaxing job of planting a shelter belt comes after routine chores. Feeding Hogs Photo by: Lisa Waldner It's common to see large hog-operations framing the outskirts of a colony. Pork is a kitchen staple because of the many traditional meals like Ketchup Wurst, Greipm, Lehbo Wurst and Herz Wurst, not to mention the all-time favourite: bacon. The Harvest is Ready Photo by: Kelly Hofer From combine, truck and grain-cart drivers, to cooks, photographers and the eager passengers wanting a ride, the entire community manages to involve themselves in the joyous affair of bringing in the harvest. Harvest Parade Photo by: Lisa Waldner To commemorate the completion of harvest, some communities parade around the colony roads in a train of all the combines, trucks and other farm machinery used during threshing. Everyone then gathers in the community kitchen for singing and further celebration. Watering Tomatoes Photo by: Lisa Waldner The head gardener, along with his wife, is in charge of organizing the planting, watering and picking of garden produce from the huge colony vegetable garden. Operating a Machining Center Photo by: Davey Waldner Turning to manufacturing in recent years, many colonies use state-of-the-art manufacturing facilities like multi-tasking machining centres, brakes, lasers, rollers and robotic welders. 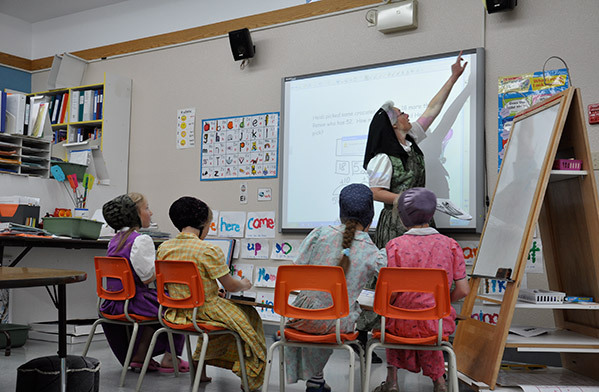 Using a Smart Board Photo by: Retto Vetteri Many colonies have trained teachers who try to promote Christian Hutterian values, morals, culture and religion within the context of school curriculums. Picking Apples Photo by: Lisa Waldner Apple orchards are a charming and vital part of autumn; evening walks would be half the fun without some apple-tasting along the way. 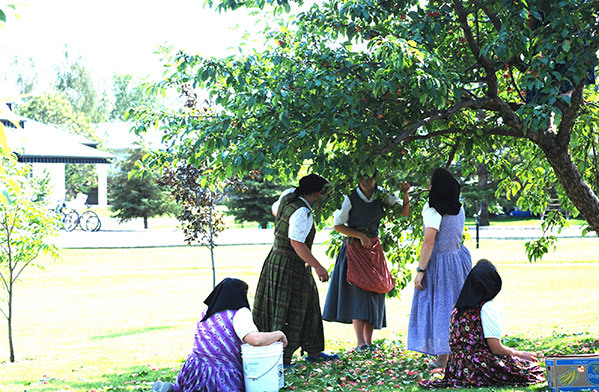 Once the apples are picked, women make apple cider, apple juice, apple chips and fruit leather. 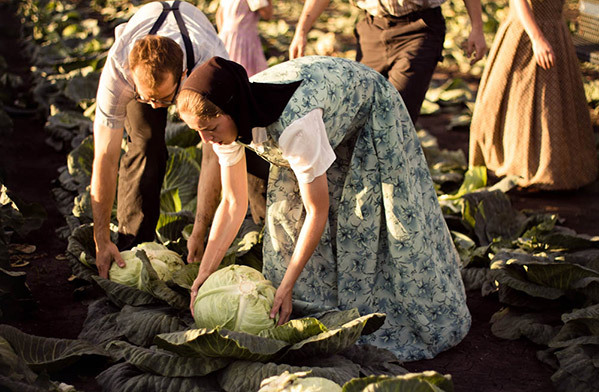 Collecting Cabbage Photo by: Kelly Hofer Come fall, everyone pitches in to gather the vegetables from the garden, carefully storing them in the colony root-cellar. A favourite winter staple is the traditional Sauerkraut, made by fermenting cabbage. Building a House Photo by: Lisa Waldner Since men are all assigned a specific job within the community, each colony is self-suffiecient with a carpenter, electrician and plumber who work together to meet the needs of the Hof. Planting Peppers Photo by: Lisa Waldner Most colonies have huge gardens where they try to grow all the fruit and vegetables needed throughout the year. Canning Corn Photo by: Lenita Waldner Though you can't beat corn-on-the-cob, much of the corn grown in the colony garden is canned or frozen for winter use. Processing Chickens Photo by: Retto Vetteri Many colonies raise poultry for their own used; fowl is processed in a specially equipped facility, where Diene (unmarried ladies from 15 and up) do most of the packing work. 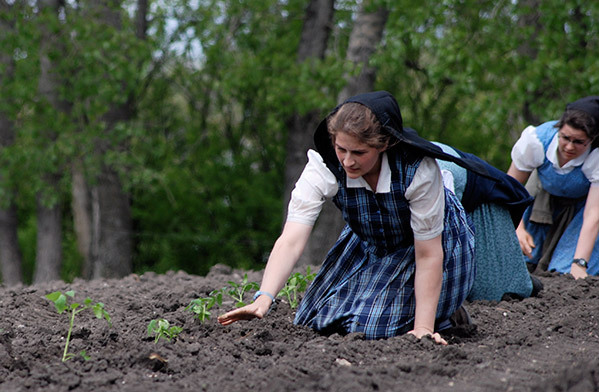 Maintenance Work Photo by: Kelly Hofer For the most part, Hutterite colonies are self-sustaining and do their own maintenance. 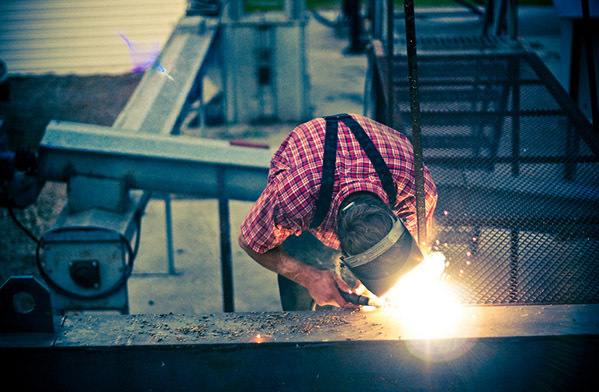 For example, if a pipe breaks it can simply be sent to the colony metal shop to be repaired.